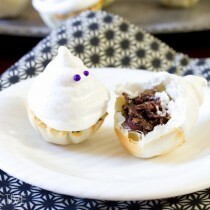 Easy Halloween Treats your kids can make! 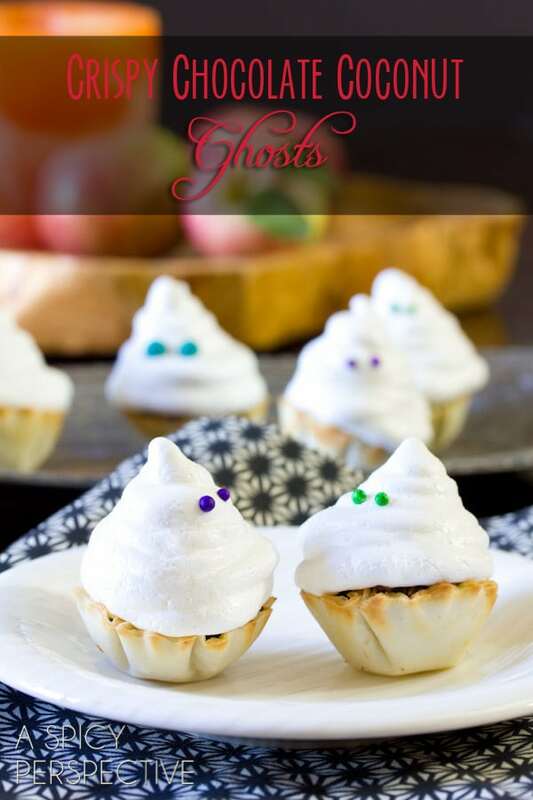 These cute little ghosts deliver a punch of flavor on the inside. I’ve always wanted to be the girl with the cute ideas for elaborate photo albums and birthday decorations. I’ve always wanted to make the cute fondant cupcakes and ornate cake pops. But alas, it’s just not in me. My brain automatically goes to the practical setting, overriding cute. Yet this year I thought I’d try my hand at using this concept to make cute AND practical Halloween treats. Practical, meaning they taste good. Are so easy to make the kids can take over this project. Are deliciously rich with chocolate coconut filling, speckled with dried cherries. 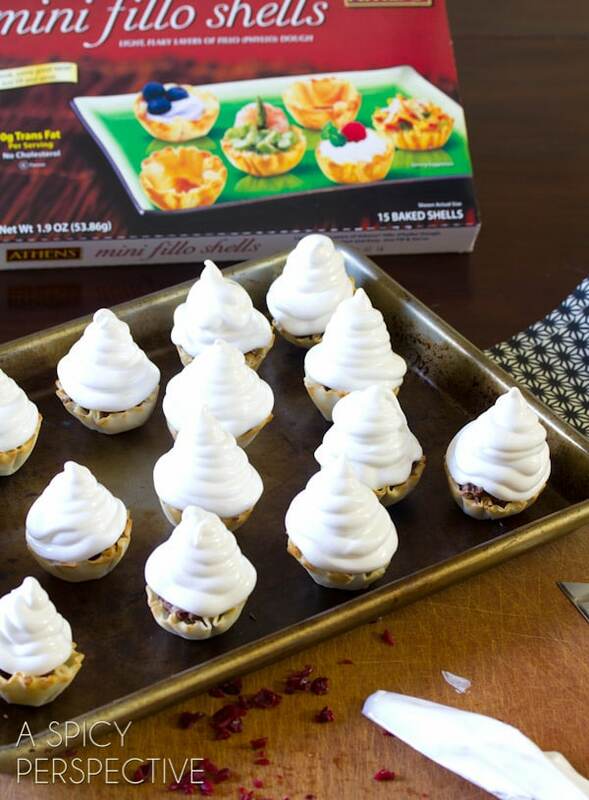 Have major crunch-factor from the baked meringue and Athens Mini Fillo Shells. And they are SO DARN CUTE! Look at me, I did CUTE!! 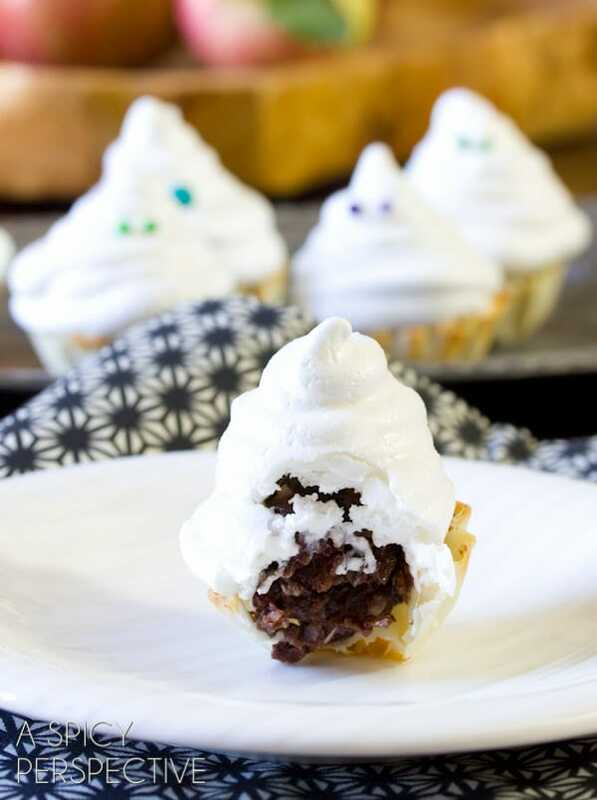 The Athens Mini Fillo Shells are the perfect base for these little Halloween treats, because they hold the chocolate coconut filling and are a wonderfully crunchy platform to pipe the ghosts on. 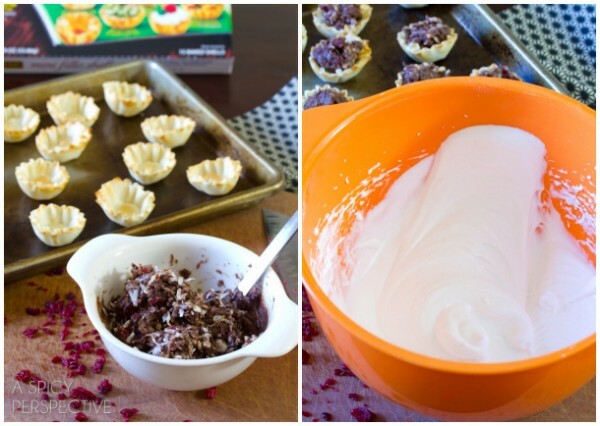 The meringue ghost-topper covers the filling and attaches to the fillo cups to seal in the chocolatey goodness. Then simply place a couple small candies or sprinkles on the ghosts for eyes and bake at a low temperature until hard. If I can do cute, you can do cute… trust me. Visit my Halloween Pinterest Board for more ideas! Place the chocolate and sweetened condensed milk in a medium bowl. Microwave on high for 30-60 seconds until the chocolate is melted enough to stir into the milk. Add the coconut and dried cherries. Mix to coat. 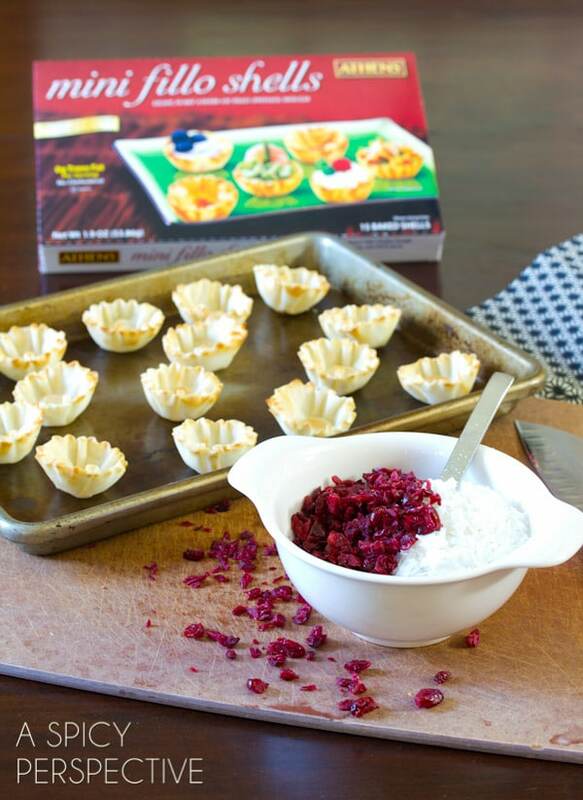 Place the Athens Mini Fillo Shells on a baking sheet. Scoop a 2 tsp. portion of the mixture into each shell. Preheat the oven to 200 degrees F.
Then add the egg whites and cream of tartar to a clean mixing bowl. Use an electric mixer to beat the egg whites until frothy. Once frothy, beat while slowly adding the sugar and vanilla. Beat until the sugar is dissolved and the eggs have turned into a firm white meringue. The meringue should be stiff enough to stand up on its own. Place the meringue in a piping bag with a medium tip (or a plastic bag with the corner cut off.) Pipe a a pile of meringue on top of each fillo cup to form the ghost. Then place two small candies or sprinkles on each pile for eyes. Bake for 60-90 minutes until hard and crispy. Cool completely before serving.